This week, my CSA (Lazy Eight Stock Farm) share had lots of greens. First rule for keeping greens fresh – do not wash them until you are ready to use them. In the meantime, store them in veggie bags in your refrigerator’s crisper drawer. They will stay fresh and crisp much longer this way. A second necessity for greens is a salad spinner. After soaking greens in water to clean them prior to using, a salad spinner is key to getting them dry and crisp again. When it comes to using the greens, smoothies are a great option. Here are several recipes to consider: Rainbow Swiss Chard Smoothie, Swiss Chard Green Smoothie with Lime and Banana, & Swiss Chard and Oat Smoothie. Don’t feel limited by the greens in these recipes. Switch out the chard for kale or any of the other greens you have on hand. Using the greens as replacements for tortilla shells or buns is also another great option. Use greens (romaine or swiss chard) this week with the Slow Cooker Pulled Chicken BBQ recipe for a new twist on a BBQ sandwich. 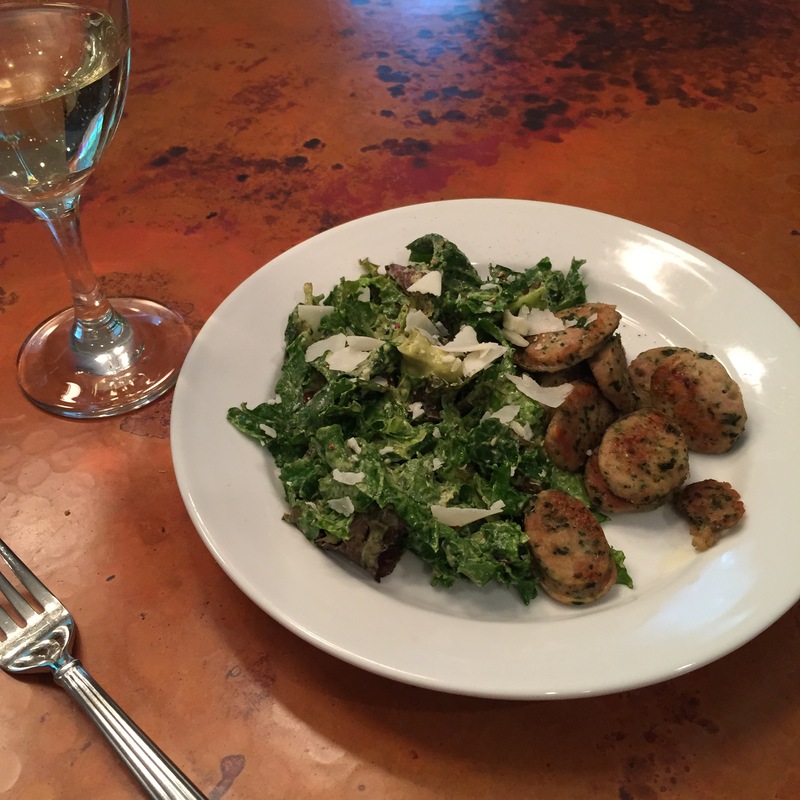 Another great way to use greens is the Kale Caesar Salad. This is a great take on a classic. However, if kale scares you, make it with romaine lettuce. Either way, the dressing is fantastic and deserves some sort of greens to showcase itself! Trying to get your family to eat more veggies? Try roasting them. Roasting creates a crispy edge and brings out natural sweetness. If you do it my way, the veggies are lemony, garlicky, and a little bit cheesy. I’ve yet to meet a roasted veggie yet that isn’t improved with garlic, Parmesan cheese, and lemon. When roasting, remember to turn off the convection setting and don’t let the veggies touch each other on the pan. Both are key to roasting perfection. Let me know what you think of the Roasted Broccoli and Cauliflower. 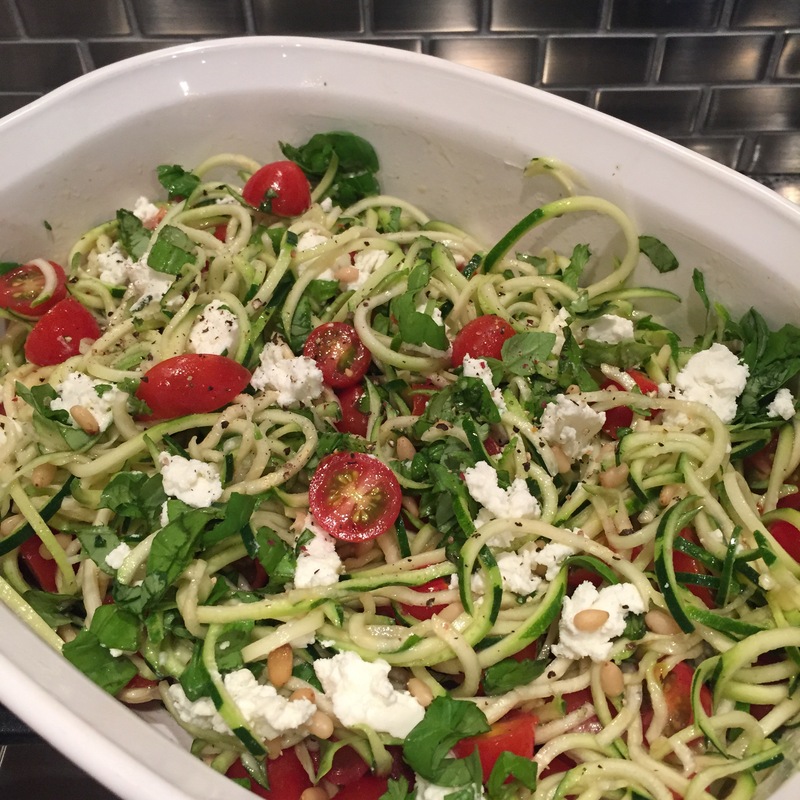 Two other fast and fresh dinner options up for grabs this week: Spinach and Zucchini Ribbon Salad and Tomato and Goat Cheese Zoodle (Zucchini) Salad. 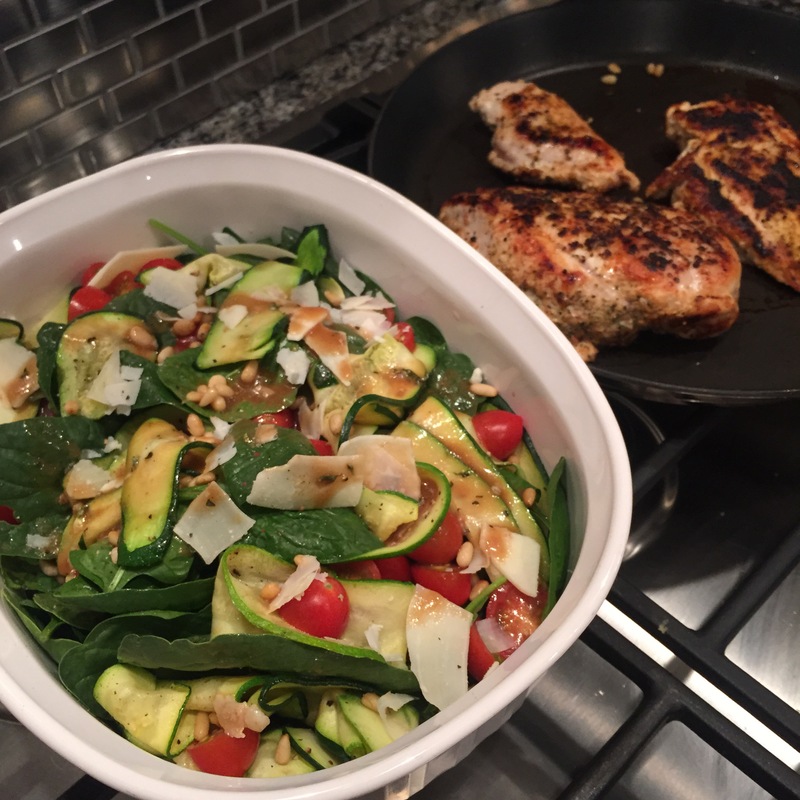 Both are quick and flavorful salads that are prepped and on the table in no time! Are you getting tired of zoodles yet? If you’ve been following me here the last couple of weeks, there’s definitely a zoodle trend. Can’t jump on spiralizer gadget bandwagon yet? Let me suggest an alternative twofer gadget that can slice and julienne. The julienne option can create short zucchini zoodles. While your strands won’t be long, luxurious curls that a spiralizer creates, they will still do the trick. In addition to the julienne cut, this gadget also makes thin slices. My family likes a little something sweet after dinner. 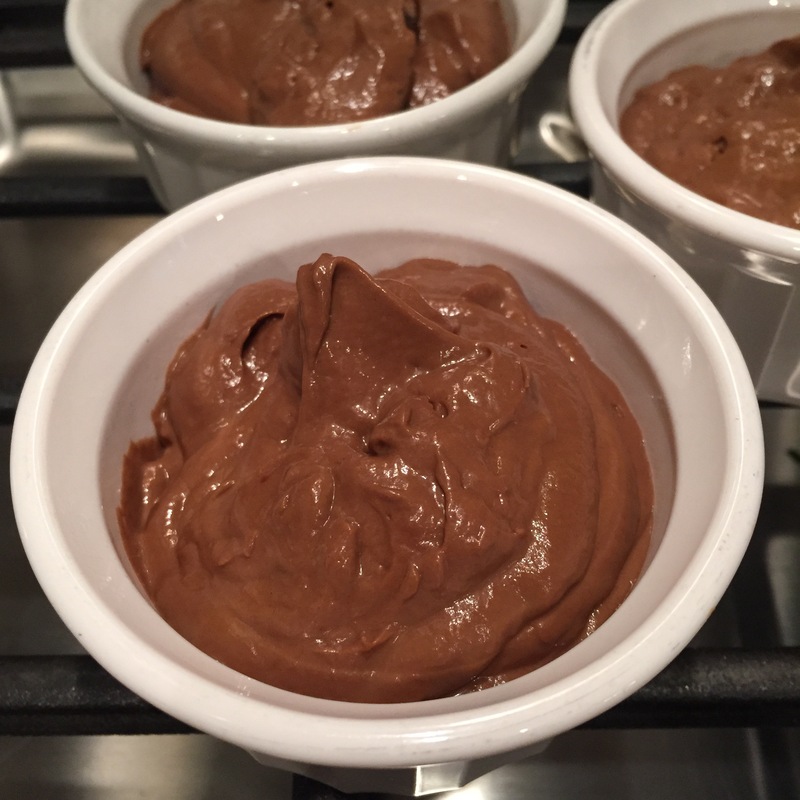 This week, we revisited Chocolate Banana Avocado Pudding. Throw a few ingredients in a blender or food processor and, voila, pudding is served! The avocado is undetectable and creates a rich and creamy texture that is a crowd pleaser. In the next week or two, We Eat For Real will be hosting a guest blogger who is going to share some tips for creating a deck garden using window planters and several of her favorite recipes for organic greens. Take notes folks. She’s killer in the kitchen!! Mobile viewers, scroll to the bottom to sign up to for We Eat For Real recipe emails. Directions: Add all ingredients to a blender or food processor. Process until smooth and creamy. Serve immediately. Try adding one tablespoon of creamy almond butter (or other nut butter) to individual servings. Trust me, it’s lose your mind good! Directions: To a small food processor or blender, add the anchovies, garlic, and Dijon mustard. Blend until thoroughly combined. Next, add the avocado, lemon juice, olive oil, mayo, cheese, and salt/pepper. Again, blend until combined. If the dressing seems much too thick, add 2-3 tablespoons of water. In a large bowl, immediately toss one-half of the dressing with the kale. Serve topped with additional Parmesan cheese. Note: This recipe makes extra dressing that can be reserved for later use. Store refrigerated with plastic wrap pressed down, touching the entire surface to minimize avocado browning. Serve with pan seared, preservative free chicken sausage. Directions: Add ingredients to a jar with lid and shake. Directions: Remove both zucchini ends and slice paper thin. Lightly coat zucchini with olive oil and sauté in a skillet until it begins to soften (approximately 2 minutes per side). Toast the pine nuts via skillet or microwave. Begin assembling the salad with the spinach and cherry tomatoes. When the nuts and zucchini are cool, add them to the salad. Pour one-half of the vinaigrette over the salad and lightly toss. Add additional vinaigrette to taste. Time saving tip: It’s easiest to slice the zucchini into thin strips with a shaving tool or mandolin. It can be done by hand, but it’s tough for me to get paper thin strips using a knife. Directions: In a small bowl, combine the oil, herbs, and salt/pepper. Brush chicken with oil mixture. Grill (or sauté) on medium heat for 6-8 minutes per side. Remove from heat and cover with foil until ready to serve. Directions: In a small mixing bowl (or lidded container), add the vinegar, oil, salt/pepper, and red pepper flakes. Vigorously whisk (or shake) to combine. To a large serving bowl, add the zoodles (zucchini strands) and tomatoes. Top with the remaining salad ingredients (basil, pine nuts, and goat cheese). Pour the dressing over the top. Season with salt/pepper to taste. If serving with Herb Chicken, cover and refrigerate until the chicken is ready. 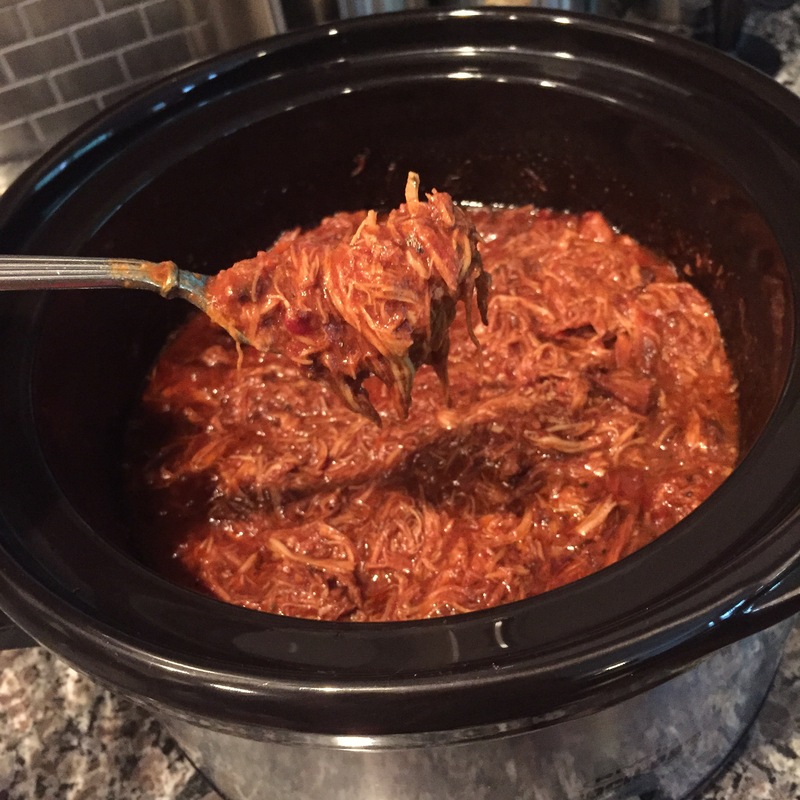 Directions: In the slow cooker bowl, prepare the Homemade BBQ Sauce (see below). Add the remaining ingredients and stir to ensure the chicken is evenly coated. Cook on high for 3 hours or low for 6-8 hours. Thirty minutes before serving, use a slotted spoon to remove the chicken. On a cutting board, use two forks to shred the chicken. Return the chicken to the slow cooker, and allow it to cook for the remaining 30 minutes. Serve on buns or in a swiss chard or romaine lettuce wrap. Time saving tip: Prepare and refrigerate the night before. Turn on the slow cooker when you head out the door in the morning. When you get home, all you will have left to do is shred the chicken. No worries if you’re going to be gone longer than eight hours. I’ve cooked it for as long as 10 hours and the chicken just melted in your mouth! Directions: In a medium bowl, add all ingredients. Stir to combine. Directions: Preheat the oven to 425 degrees (not convection setting). In bowl, toss the veggies, olive oil, salt/pepper, & garlic. Spread the veggies on parchment paper or a foil lined baking sheet. Veggies pieces should not touch each other. Roast at 425 for about 20 minutes. Use a spatula to turn the veggies over halfway through roasting. Serve with a sprinkling of Parmesan cheese and freshly squeezed lemon juice. Serve immediately. Reblogging this because I love greens!!! Always looking for tips and tricks. Enjoy!